Buzzy, Flaps, Ziggy, Dizzy – my all-time favorite funny and brave vultures from The Jungle Book, always bored and always saying, “What we gonna do?” “I don’t know, what you wanna do?” Disney had these vultures resemble ‘The Beatles’, with mop-top haircuts, physical appearance, voice and style. The other vulture hero that immediately comes to mind is Jatayu, who tried to rescue Sita from Ravana, after the latter kidnapped her and was carrying her away to Lanka. Raja Ravi Varma‘s famous painting depicts this scene beautifully. 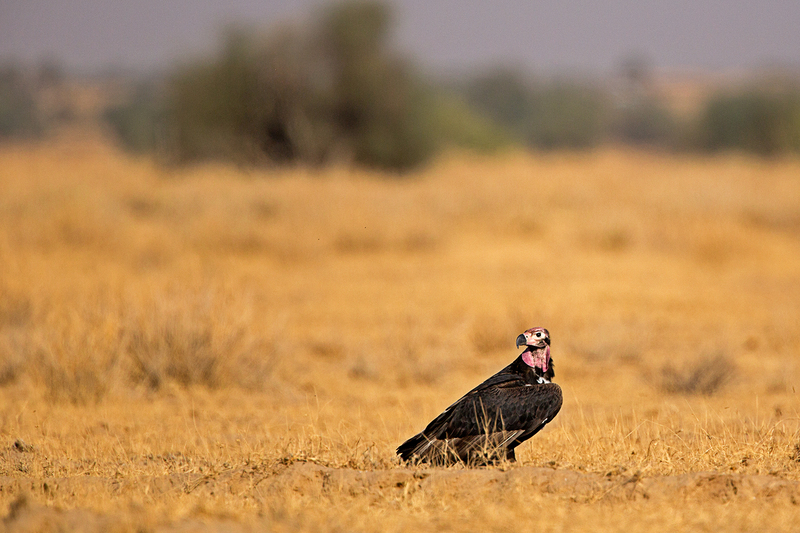 Vultures have made many a folk tale or mythological story interesting. But the real life story of vultures themselves isn’t as glorious. 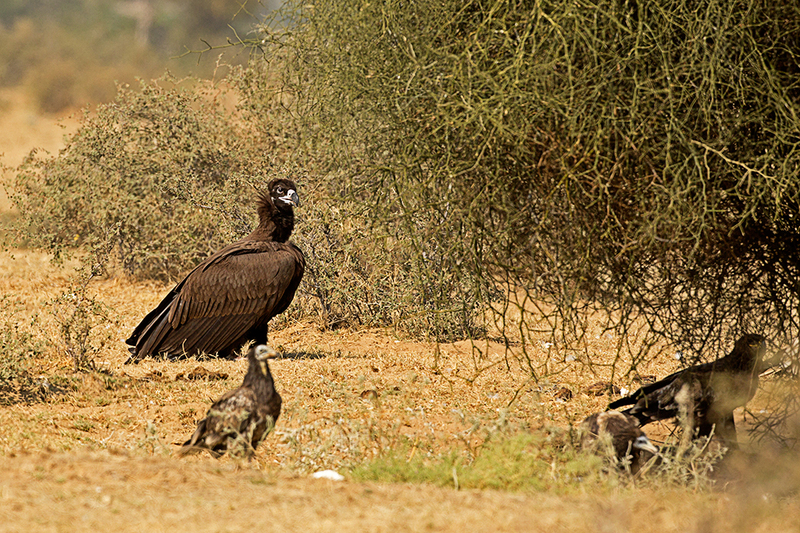 Once seen in large numbers, these scavengers help in cleaning the ecosystem. In fact, Parsi Tower of Silence in many places has open-air concentric rings where human bodies are left, and vultures used to consume them within hours. 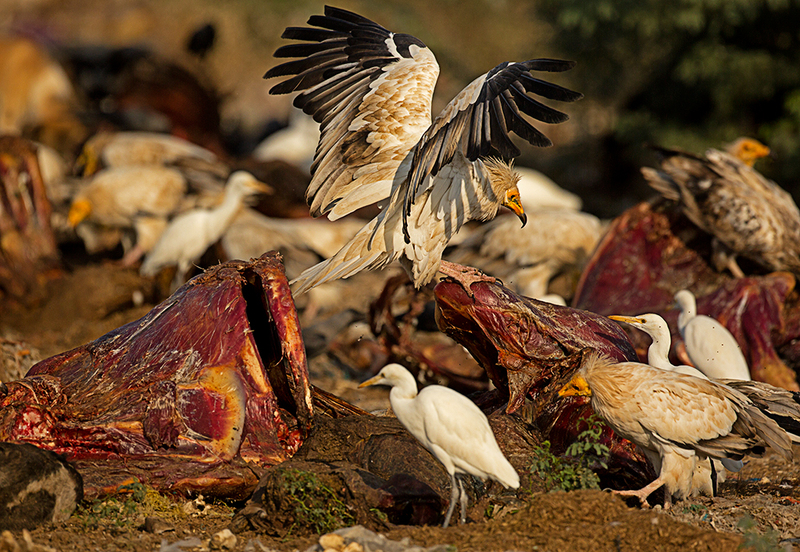 India was home to about 400 million vultures once upon a time. They were getting to feed on a large number of livestock carcasses. These numbers have slowly declined now, and it is attributed to Diclofenac. This painkiller is used to alleviate pain in cattle, but proves to be a killer to the vultures, who suffer irreversible kidney failures. Meloxamin has been tried and tested as an alternative to diclofenac. 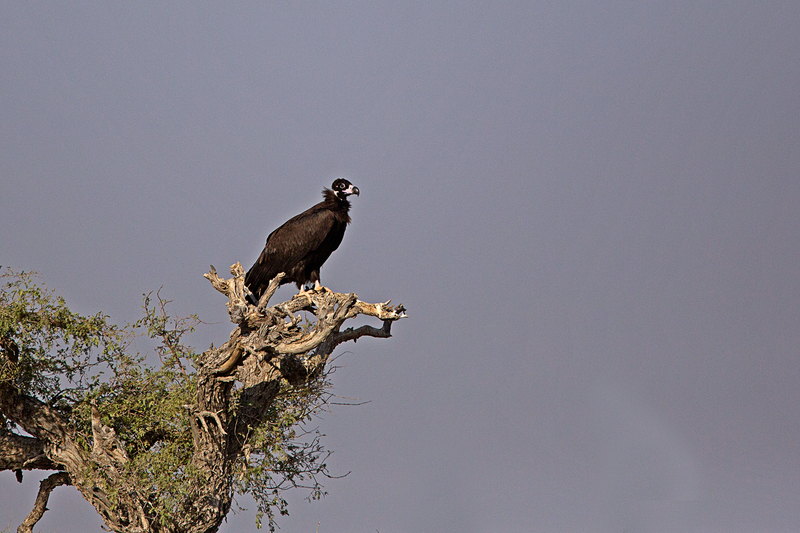 “sunehri” Cinereous Vulture, tall, dark and handsome. With so few vultures for us to see in our cities, we always need to head out to those pockets which still shelter these majestic birds. 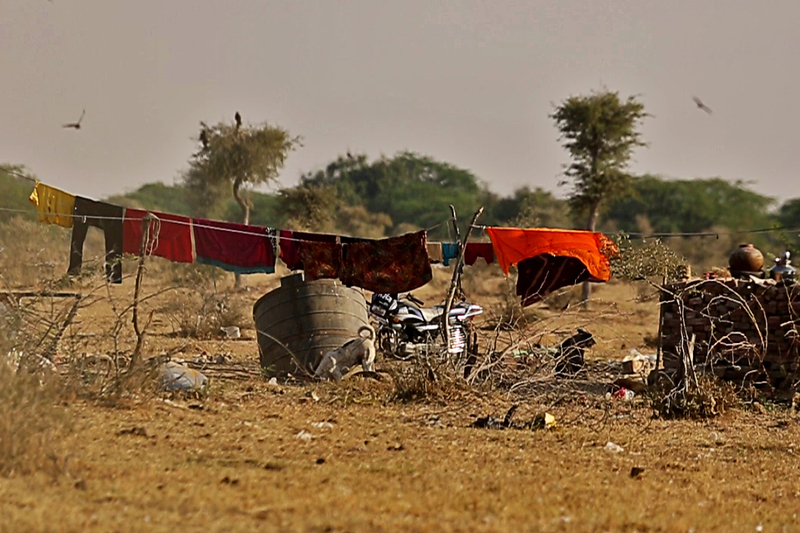 One such place is the Desert National Park, Rajasthan. We were in a jeep, totally awed by the desert and how different it was. Our driver suddenly pointed ahead, saying, “Sir, sunehri vulture!” It was a Cinereous Vulture, not sunehri 😉 Sunehri roughly translates to “golden” in Hindi. 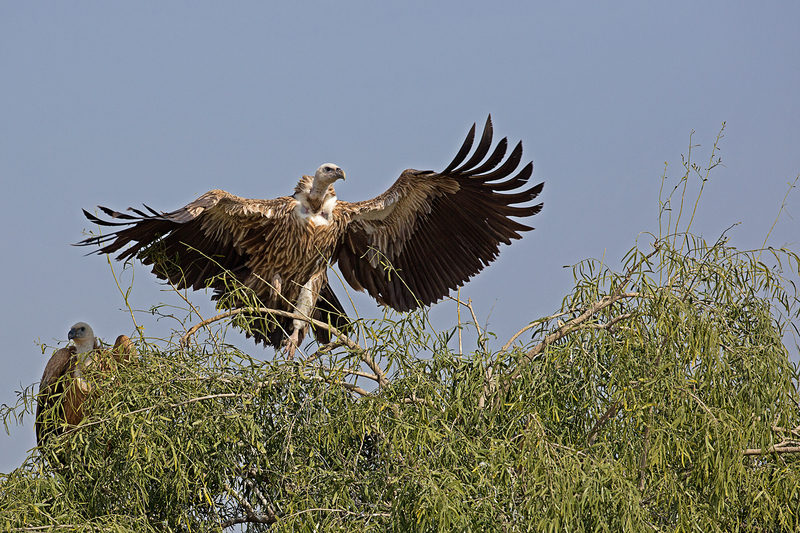 Our vulture – all of dark blackish brown, having no trace of golden, did create a sunehri moment, nonetheless. A few meters ahead stood this Red-headed Vulture, a Critically Endangered species. I mentally prepared myself thoroughly to face the stench. 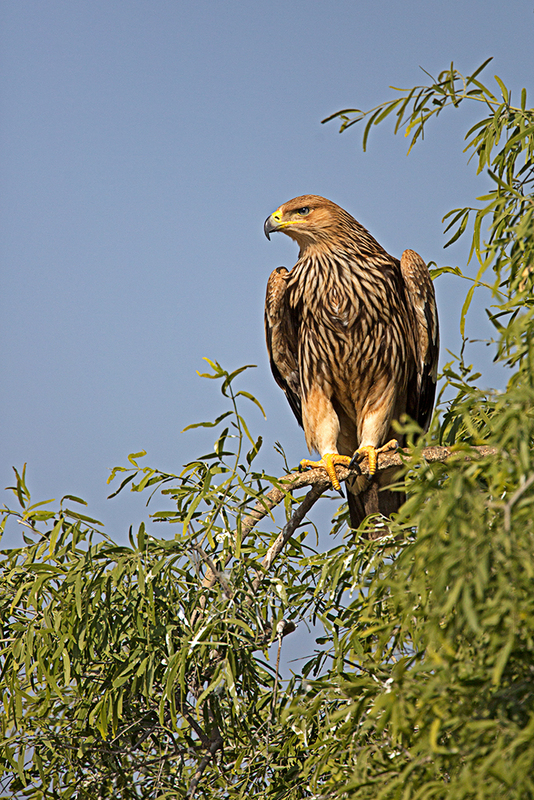 We began seeing birds of prey like this drop-dead-gorgeous Eastern Imperial Eagle, Steppe Eagle and Griffon Vultures. Well, no stench so far. So far, so good ? I didn’t know. I realized that we weren’t even close to the actual dump to smell anything. 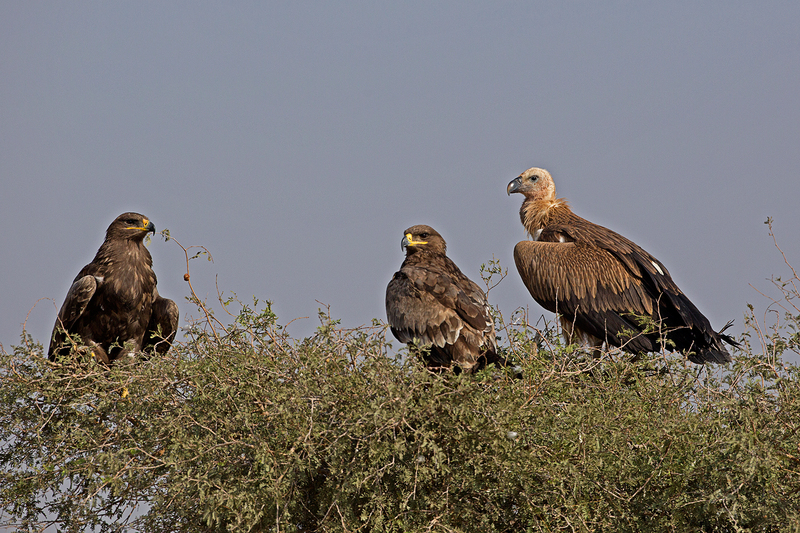 Steppe Eagles and Griffon Vulture, birds of a different feather flock together! Further ahead, we saw the huge and mighty Cinereous Vulture, also knows as the “Monk Vulture” translated from its German name of Mönchsgeier. A monk’s cowl is a long garment with wide sleeves and a hood. 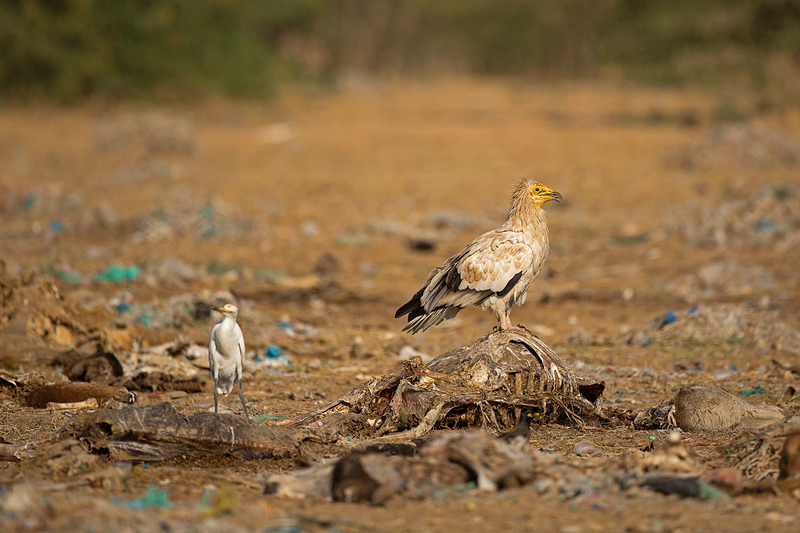 See this image in the wiki for cowl and you’ll know exactly why a Cinereous Vulture fits the name so well 🙂 Egyptian Vultures (ಜಾಡಮಾಲಿ ಹದ್ದು) walking next to this giant appeared so tiny! And then, the moment finally arrived. Mounds and mounds of dead cattle covered the ground. There were vultures in plenty, mostly the Egyptian and Griffon Vultures, the numbers reminding me of the pigeons back home. 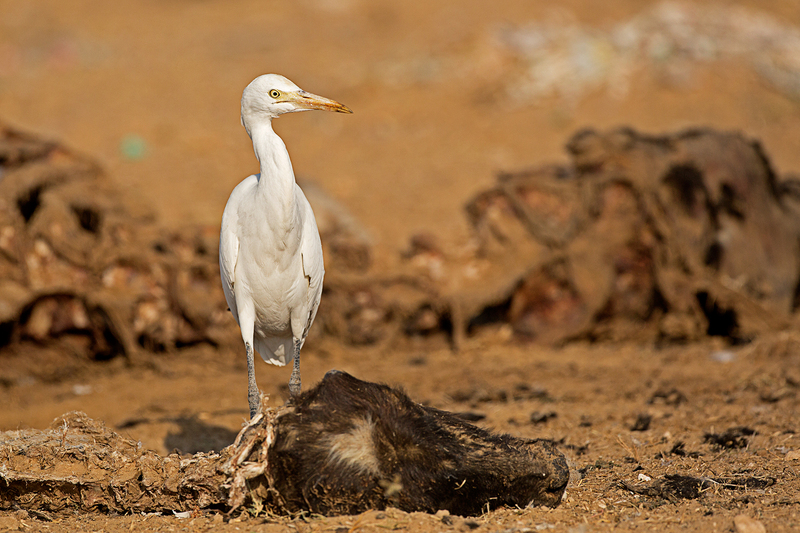 What was more surprising was to see egrets and different kinds of mynas foraging on the carcasses. We usually see mynas pecking nicely at flowers and fruits, and here they were, hopping around the mounds. The non-scavenger birds were making good use of the location and the situation, feeding on insects and such. 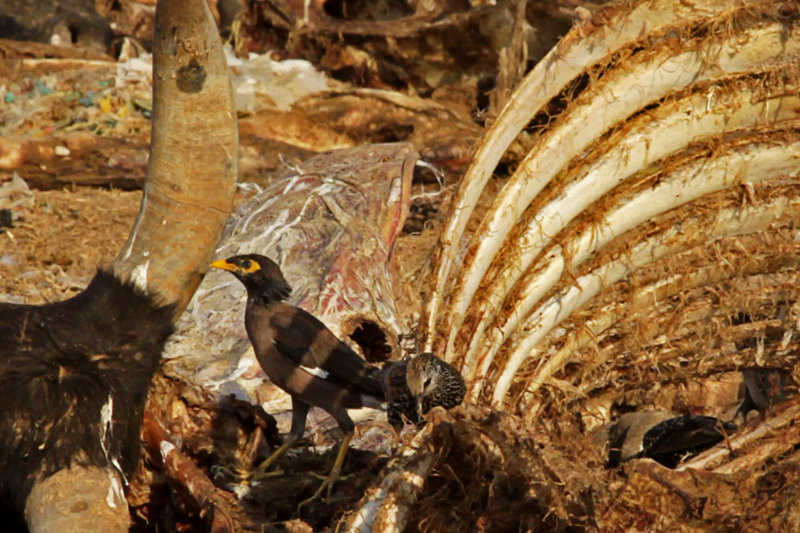 We have seen mynas around garbage dumps quite often, but surely didn’t expect them here! We watched the Egyptian Vultures tear away the bloody flesh. I was so well prepared, I got used to the smell in no time. But Rana had to literally use gag control 😉 He couldn’t drink water without rinsing his mouth thrice! In fact, even reviewing the images on camera made him feel the smell over and over again. was a mini settlement. The clothesline indicated that people actually stayed there. 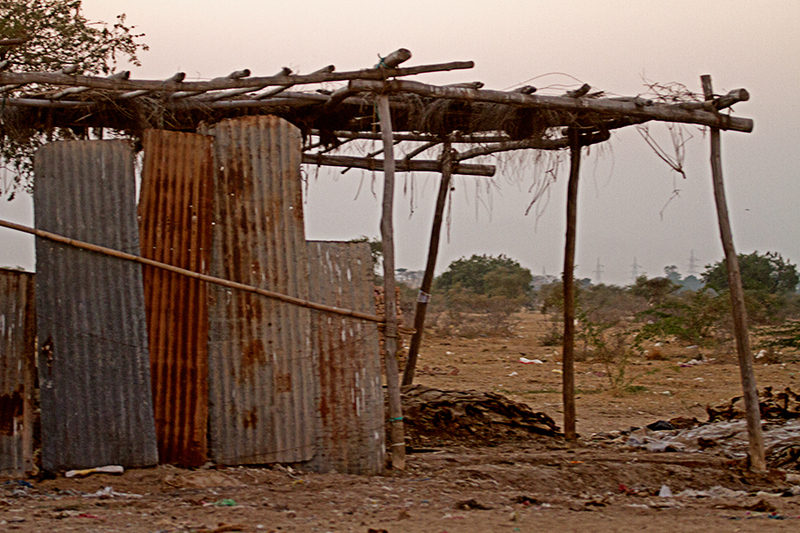 A man walked right into the dumps as casually as we would stroll in a park. The dogs were unperturbed, as if he was one of their group. He joined a few other men a few meters behind. We saw them tearing the hide off a freshly dumped body. Moving ahead, we saw hide being put out for drying – this probably smelt more than the carcass! Yet another perspective from a dump yard, with people trying to make a living out of what’s available. They bear the hardships. They are used to it. 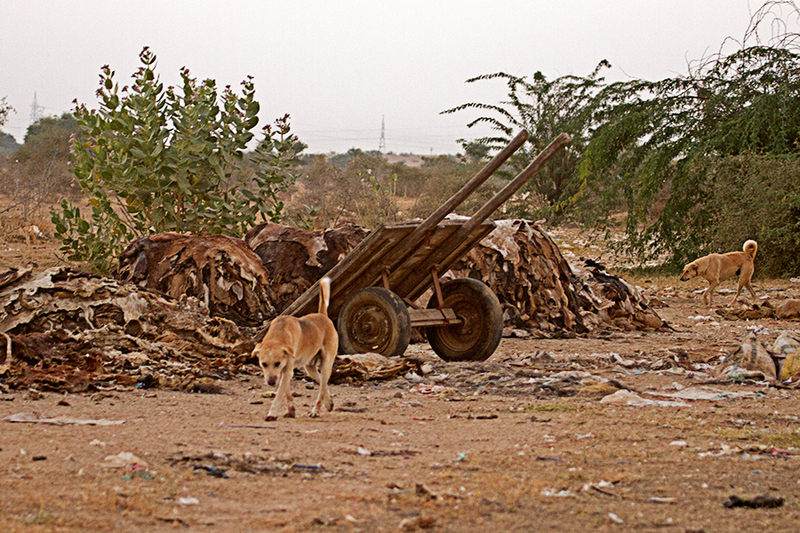 A dead animal providing so many others with food and/or livelihood – who says there is no life after death?